How To Make Effective Social Media Videos? Videos dominate social media nowadays, and their effectiveness compared to any other type of content has been proven time and time again. Still – just because videos have a lot of potential that is no guarantee they will be successful, and some videos are far more effective than others. The most reliable measure of the effectiveness of a video on social media tends to be engagement. To put it simply, videos that engage viewers are able to retain more viewers and ultimately more likely to fulfill their goals and encourage more likes, shares, comments, and other reactions. The attention span of viewers on social media is generally low, and most are unlikely to sit through a long video. That is why short videos are better able to retain viewers and keep them watching all the way through to the end. Of course if you want to create short videos then you will need to plan them as such. That starts with choosing a topic that is tightly focused and then structuring the video so that it is direct and succinct in delivering its message. It can help to script out the video to get a rough idea of how long it will be, and then try to improve on it further. While there are no hard and fast rules regarding the optimal duration for social media videos, you should try to aim for videos that are anywhere between 15 to 60 seconds. Have you noticed that viewers tend to react to videos that are funny, surprising, or inspiring? That is far from a coincidence, as these videos provoke an emotional reaction and that makes them much more engaging. If you’re able to make your viewers feel any sort of emotional response when watching your video, they’ll be more likely to keep watching and react to it when they’re done. The exact emotion itself doesn’t matter, but the more intense a response they feel – the better. While there are many ways to provoke an emotional response in viewers, one of the most effective is to structure the video as a story. If you do that you can make them feel invested in the subject and the outcome of the video, which is more likely to make them feel strongly about it. One of the mistakes people often make when creating social media videos is to rely too heavily on a voiceover to ‘tell’ people the points that they’re putting across. Considering videos are so effective because of their ability to visually deliver information – that is definitely counter-productive. For every point and message that you want to deliver in your video, you should consider how it can be ‘shown’ visually. That will ensure that your videos make more of an impact, and are able to retain viewers and keep them engaged. In fact nowadays you should try to create social media videos that can deliver their message even if muted. While that may require captions (or subtitles in some cases), it can help reach the large number of viewers on social media watch videos without audio nowadays. By far the one surefire way to create more effective social media videos is to learn from every video that you publish. To do that you’ll need to track and analyze its performance and try to figure out how you could improve upon it further. At the end of the day there are no ‘one size fits all’ measurements that can make social media videos effective and it depends on numerous factors – chiefly the viewer demographic. If you analyze and learn from your videos, you’ll be able to find out exactly what is effective for the viewer demographic that you’re targeting on social media. Creating videos using these tips can be tricky, and ideally you’ll want to have a powerful video editor that you can call on. While Mac users have one built into OS X in the form of iMovie, if you want Windows version of iMovie there is none that exists. That is why your best bet is to try Movavi Video Editor Plus instead. 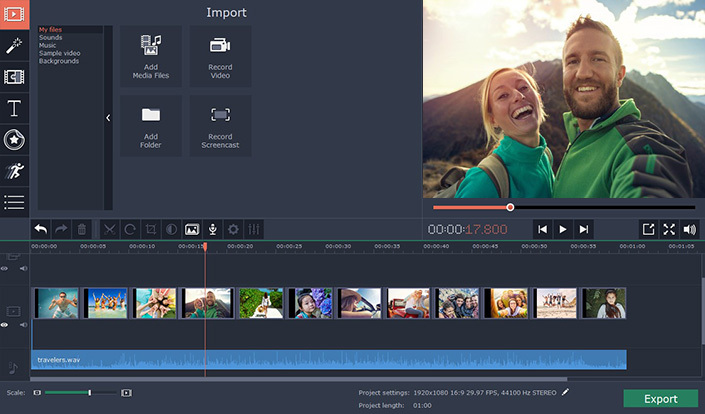 In many ways Movavi Video Editor Plus is as close to a perfect Windows version of iMovie as you’ll get due to its similarly intuitive approach and powerful features. With it you can compile an impressive video for social media, complete with background music, special effects, animated transitions, creative captions, and more. To be honest there’s very little you can’t do with it, and with the tips listed above your videos should definitely be much more effective.